After our meal at Vietnamese noodle restaurant,we headed out to War Remnants Museum on a cyclo. One of the drivers could carry out a conversation in English so we felt at ease. We agreed on the price he said for a one way trip.We exchanged pleasantries as the three drivers pedaled the three-wheeled vehicle. Minutes later, they unloaded us in a secluded corner. My jaw dropped when the "friendly" guy charged each of us 500,000 Vietnamese Dong, about $25 (up to ten times the original price). I started to argue but sis didn't want to make a scene so she paid the amount he asked. There were no police nearby and there was nothing we could do but pay the other 2 drivers. What a rip off!!!!!! Although my sis and I were here in December, we failed to visit the museum. It was closed for the Christmas celebration. This time our top goal was to see it. The main building has 4 floors. In each floor there are 2 themed rooms. The museum showcases graphic stills of Vietnamese war victims and brutal treatment of political prisoners, artifacts and declarations, photos of anti-Vietnam war protests staged in different corners of the world. Mao Tse Tung expressing China's full support to the Vietnamese people. A photograph of the anti-war demonstration in Manila, Philippines. One of the eight themed rooms. Ordnance lay in a corner at the museum. In another building, we found a replica of "tiger cage" ( prison). Tiger cage housing a political prisoner. US Military equipment sprawled in the museum's yard. 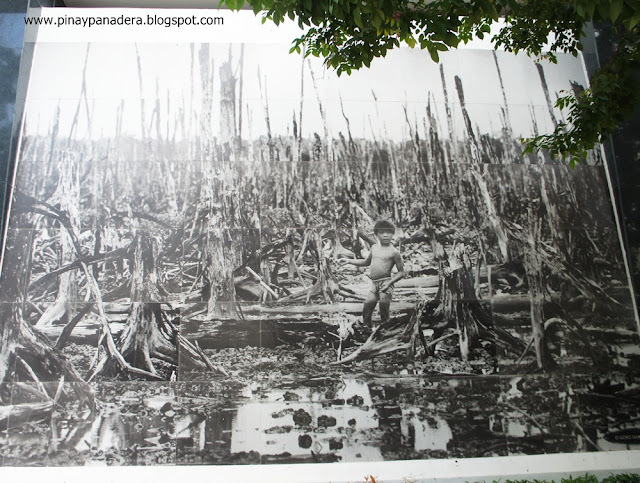 A photograph by Goro Nakamura showing a mangrove forest destroyed by chemicals. I almost bawled my eyes out learning about the atrocities during the US-Vietnam war. As we concluded our museum visit, I have developed a deep sense of respect and understanding of Vietnam's history.